Xiaomi’s upcoming Mi Mix 2 could become the first smartphone to feature Qualcomm’s updated Snapdragon 836 chipset. Xiaomi has confirmed via Weibo that it will announce the Mi Mix 2 at an event in China on September 11. The Mi Mix 2 will also be designed by French designer Philippe Starck and Mix 2 is expected to sport even thinner bezels than its predecessor. The Xiaomi Mi Mix 2 has been part of multiple leaks in the past and this is the first time we are hearing about the inclusion of the Snapdragon 836 processor. Earlier reports suggested that Google’s 2017 Pixel lineup could be the first to get the updated processors. Qualcomm is yet to officially announce the new mobile platform but GizChina has obtained an image which shows the use of Snapdragon 836 processor. The image also shows the handset will sport a 6.2-inch display with Quad HD+ resolution of 2960 x 1440 pixels. Xiaomi recently signed a deal with Samsung to use the South Korean giant’s Super AMOLED display on its smartphones. The display on Xiaomi’s Mi Mix 2 could be the same as the one found on Samsung’s Galaxy S8+. 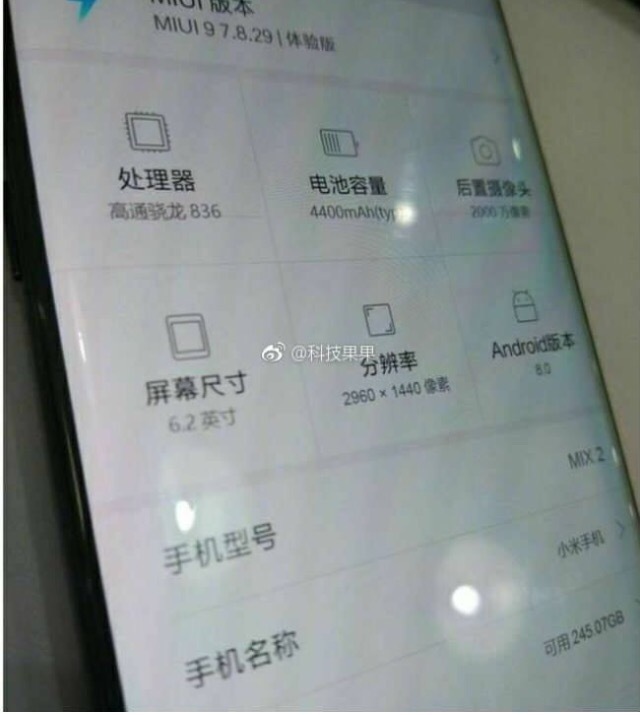 The leaked image also shows the smartphone to be running Android 8.0 Oreo with MIUI 9 skinned on top. It remains to be seen whether Xiaomi launches the device with new Android 8.0 Oreo or Android 7.0 Nougat. Furthermore, the leak says that the device will use a 20MP rear camera unit and will be backed by 4400mAh battery. The Mi Mix 2 is also speculated to come with internal storage option of 256GB. The Xiaomi Mi Mix was announced last year in October and was one of the first devices to make edgeless design mainstream among smartphone makers. In the past year, Samsung and LG have adopted a similar design language and with the Mi Mix 2, Xiaomi is expected to further trim the bezels. Apple is also expected to announce a redesigned iPhone with an edge-to-edge display on September 12 and with Mi Mix 2 arriving a day earlier, it remains to be seen whether Xiaomi steals the thunder from Cupertino giant.